Have you ever asked yourself what it is that sets the big blogs apart from the many small ones? Not all factors are as obvious as endurance, for example. A major factor is the way you approach the work of blogging. Because that’s what blogging is. A type of work. The more professional the work is done, the better the chances of creating a large and significant readership and following. Thus, professional bloggers often work with checklists, to make sure they don’t forget anything. For today’s article, I’ve created such a blog checklist for you. Recently, I’ve brought you another blog checklist that contained things to be done before publishing an article. However, high-quality blogging is more than simply working off a list ending with publishing a post. After the release, there is still a bunch of critical work to do, which is crucial for the quality of your blog. That’s why today, I’ll show you ten things you should do after publishing a post. This second quality check will increase the value of each of your blog’s articles drastically. Immediately after being released, you should share the post on your social networks. Don’t forget any of them. It is essential to get traffic as early as possible. After sharing, it is important to overhaul your post. After the overhaul, you should find out when the majority of your followers is online, using the Facebook statistic function (if you are active on there), and then share your article again during these periods. You should wait for a few days between the first and second sharing. I’m sure that you put a lot of time into an article before publishing it. But when you’re like most other bloggers, your articles are guaranteed to contain spelling and style mistakes. Or maybe there are parts of the article that could use more elaboration. That’s why I recommend reading your articles again to remove errors, stylistic quirks, and to elaborate lacking parts. This sounds like a lot of work, but you should put it in. The quality of your posts increases tremendously. You readers will thank you. On top of that, well-elaborated articles will quickly create your expert reputation on the topic. Your email subscribers are your most loyal readers, as they gave you permission to send them emails. This means a lot, as nowadays, there’s a lot of email spam in everyone’s inbox. However, before your article is sent to your newsletter list, you should assure that it was corrected and reviewed. Your subscribers aka VIPs are a lot more important than your Facebook followers or fans. Thus, make sure that you only present them high-quality articles. If you don’t have a newsletter yet, I recommend offering one. Email marketing is still one of the most favorable factors for professional blogs that want to earn money. Of course, this procedure can be automated, by setting the newsletter up to be sent out daily or weekly. I’m sure that you’re a member of specific groups within your social networks. Always share your articles with these groups as well. Interesting groups can be found on Facebook, LinkedIn, Xing, and Google+, for instance. If you’re not a member of any group yet, I recommend looking into this topic and then joining groups that deal with your topics. This way you can directly address your target group on social networks. If you publish a lot of articles that don’t become outdated too quickly, you’ll have created genuine gold after some time. You can use these articles again to drive additional traffic to your new articles. Thus, always dig out your most successful old articles and link them to new posts with a similar topic. 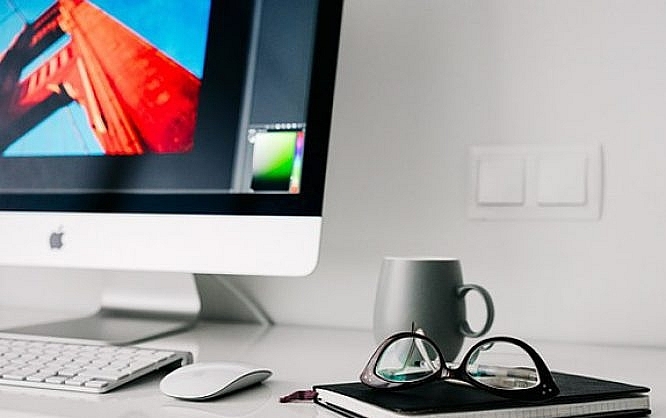 For one, your old successful articles make sure that your new articles gain more traffic, and at the same time, you’ll build a strong SEO structure, due to the internal linking. Getting the first comments on posts is a tough challenge for young and new blogs. Unfortunately, only very few people are willing to leave a comment and discuss the article. That’s why you should never ignore a comment. Make replying to comments your highest priority. This creates an active connection with your readers, which then might just give you their email address for your newsletter. On top of that, Google also pays attention to comments. It is very likely that Google will rank articles with lots of comments higher than articles without comments. When you publish more and more content, you should look for partners in your niche. Over time, these connections can be very advantageous and profitable for both parties. You could post guest articles, which at best boost traffic on the partner’s websites. 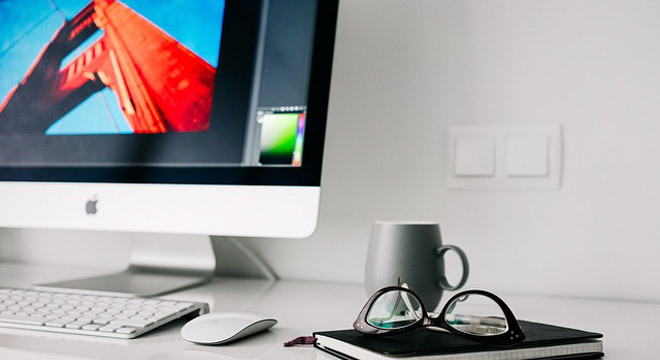 Additionally, it is possible that the connection results in a content syndication partnership, which could increase your post’s range exponentially. Once you developed a syndication partnership, you made it. There’s nothing better that can happen to you. You should take advantage of this partnership as often as possible. Content syndication means nothing else than double utilization. Your posts will then be published on your partner’s blog, and your partner’s articles will be displayed on your website. However, you should pay attention to double content as Google doesn’t like that. This can be accomplished by linking the original article: “This article first appeared on yourpage.com”. Additionally, the article on the partner page should also contain an author bio with a link to the website. The optimal solution would be a canonical link to the original article so that Google is sure that it’s not double content as well. Search for the most influential and well-visited blogs in your niche. Contact every single one of them, and ask the bloggers to read and give feedback on your article. Ask them to tell you what you could improve. Not every blogger will reply. But when one of them does, you’ve already gained a lot and went up one stage on the career ladder of bloggers. If you struggle to find the influencers within your niche, you can use the tool Buzzsumo. One request a day is free. 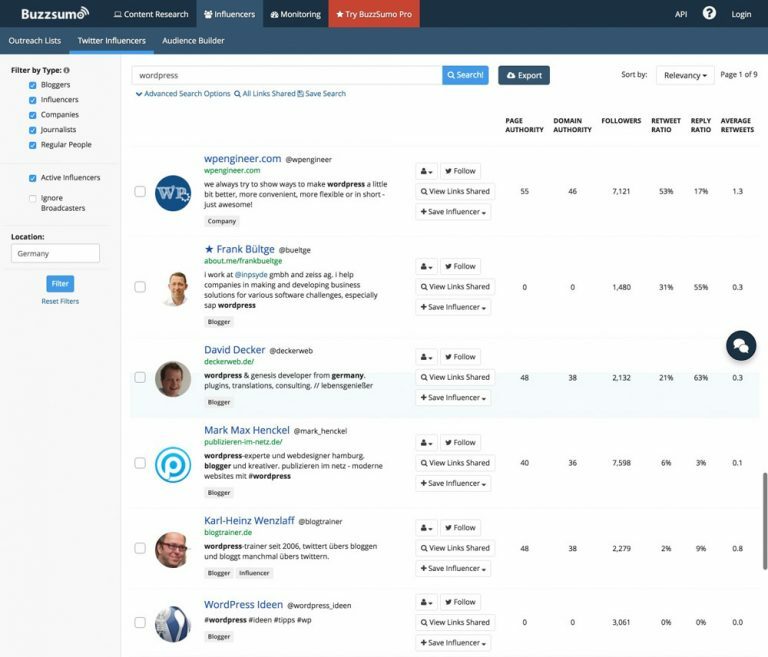 Buzzsumo Searches Your Niche’s Twitter Influencers For Free. Professional blogging is hard work. It’s definitely not enough to write blog posts, and let them die in the depths of the internet. Every article with over 1,000 words and notable traffic is worth being used multiple times. Thus, convert your good posts into different formats and use them again. The possibilities are almost infinite. For example, you could use your article as a script for a video. You could divide the script into smaller bits to turn it into a video series. Using it as the base for a podcast is also plausible. Of course, you could also turn it into an ebook, or a checklist. Ebook and checklist could also serve as an “email collector” for the newsletter. Plan the sharing of your articles for months in advance. Don’t share them once or twice, but a lot of times. You could share your valuable articles at least twice a week to assure that they receive maximum attention. To do that, there are multiple tools or services. I use Buffer for that purpose, as it is the best tool in my opinion. It lets you plan your posts for social networks very easily, the posts look appealing, and working with the tool is rather simple. 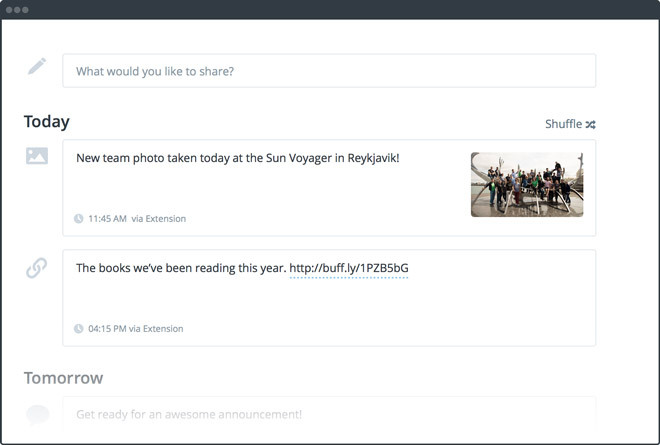 The Buffer Interface Directly in the Service’s Web Version. Buffer also provides the advantage that your posts can look differently for the different networks. In the free version, one profile per platform can post ten planned articles. However, I recommend the “Awesome Plan” for 10 USD a month. With this plan, you can fuel ten profiles with up to 100 scheduled posts per profile. Always keep a look at the numbers. If you don’t use an analytics software on your blog, quickly sign up for a Google Analytics account. Google’s analysis software is free, very extensive and exact. Google Analytics offers plenty of useful information. You’ll learn how many visitors you have, which articles are the most popular, where the visitors are from, how many pages they look at, how long they stay, and a lot more. When using Google Analytics, it is crucial to pay particular attention to privacy. You can then use the most relevant data to optimize your posts and your blog, and to develop it consistently. If you use WordPress, you can also look into some of the critical data in your website’s admin area. For that, there’s the free plugin “MonsterInsights“. Thanks for the post and specially for the 8th option as a blogger I never thought that could be a option. So from next time I will follow those steps for sure. Brilliant – when I have a good post I use ‘Quuu’ too, to get people to tweet about it. It’s 25 bucks for the web design niche, but it’s a nice little boost for stuff I spent a long time on. Finding partners to syndicate with sounds like a great idea! Has anyone tried being part of a digital marketing Slack group to share each others content? Hii thanks for this is absolutely great guidance.